Avoid all us of vitamin c creams and lotions 5-7 days prior to the chemical peel. Chemical Peel results can be heightened by prepping the skin with medical grade products recommended by your estheticians, 10-14 days prior to the peel. The provider will recommend skin care products appropriate for your skin type to be used in order to maintain the results of the chemical peel. Refrain from washing your face for at least 24 hours after the chemical peel. Some may experience a tightening and redness to the skin, which may be accompanied by some light to severe peeling. Avoid use of vitamin C, Retinol, and Retin A for 5-7 days after Peel. ALWAYS protect the skin by applying the recommended SPF. Our newest addition, The Advanced Brightening System Peel by Omni RX. The in office treatment is a superficial peel for the treatment of epidermal and dermal melasma and sun-damage. It’s Hydroquinone free with 3 treatments needed which spaced 4-6 weeks apart. Downtime is about 3-5 days of active peeling and 1-2 weeks of light flaking thereafter. This great peel includes a complete patient aftercare kit that is critical to the overall results (gentle cleanser, sunscreen, soothing balm, and Rx, Advanced Brightening cream). Picture above of Julie is after a SINGLE treatment! A mid to deep chemical peel that will help to reveal your best skin! The Omni Signature Peel is perfect for targeting hyper-pigmentation (sun spots or dark spots), uneven skin texture, blemishes, fine lines & wrinkles, large pore size, and aging. 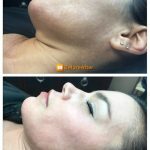 This peel can be boosted to heighten the effects of the treatment. 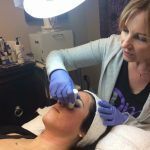 Custom applied peel solutions exfoliate dead skin cells and help healthy skin cells rise to the surface. These PCA treatments allow deeper layers of fresh and untouched skin to be revealed. The result of PCA Chemical Peels can even skin tone, clear acne, improve the appearance of aging skin and make dull complexions glow. Can be customized from light to mid-depth peel. A progressive to mid-depth peel that targets acneic, congested, and oily skin types. This light peel will help to control acne and balance oil production. Expect light flaking or exfoliation of the skin. An effective medium depth peel for All Skin Types & Ethnicities. The Perfect Derma™ Peel is the only peel that includes the powerful anti-oxidant Glutathione, which lightens and brightens the skin, slows down the aging process and helps prevent wrinkles. Our medical esthethicians will consult with you and go over your skin concerns and treatment goals to provide you with the best treatment possible, individually tailored to your skin. Call us today or use our Appointment Request Form. Book Your Chemical Peel Today!